Included with the camera is Canon's EF 24-70mm f/4L IS USM lens. This zoom lens provides a versatile range of focal lengths, from wide angle to standard portrait length. It features Hybrid Image Stabilizer Technology for up to 4 stops reduction of both angular and shift-type camera shake. Image stabilization is also effective when shooting in the lens' 0.7x macro mode. With 2 Super-UD glass elements and 2 UD elements to reduce chromatic aberration and two distinct types of aspherical elements, images are sharp throughout the zoom range. Smooth, fast and accurate autofocus is provided by the Ultrasonic Motor (USM) and the lens' minimum focus distance is 1.25'. As an L-series lens, it is provided with weather sealing to protect it from dust, moisture and cold and fluorine coatings on the front and rear lens surfaces to resist smears and fingerprints. The 5D Mark III is compatible with the WFT-E7A Wireless File Transmitter as well as the GP-E2 GPS Receiver (both not included). The WFT-E7A, which supports 802.11 a/b/g/n and sports a built-in Gigabit Ethernet connection, provides LAN and Bluetooth image transfers and features an FTP mode with automatic image resend function to ensure file delivery even if the signal momentarily drops. The transmitter also has EOS utility mode and WFT server mode, and is capable of performing time sync multiple cameras on the same network. The GP-E2, which connects via USB or Hot Shoe, automatically embeds location data into the images' metadata, including latitude, longitude, elevation, and the camera's orientation in relation to a compass reading when shooting. It also has a GPS time sync function, particularly useful when a project is shot among different time zones. Both of these accessories do not compromise the 5D Mark III's dust and weather resistance and are designed to the same rugged specifications. Requires a firmware upgrade to be compatible with the GPS GP-E2, which will be available soon. Included with this kit is Canon's EF 24-70mm f/4L IS USM lens. This zoom lens provides a versatile range of focal lengths, from wide angle to standard portrait length. It features Hybrid Image Stabilizer Technology for up to 4 stops reduction of both angular and shift-type camera shake. Image stabilization is also effective when shooting in the lens' 0.7x macro mode. With 2 Super-UD glass elements and 2 UD elements to reduce chromatic aberration and two distinct types of aspherical elements, images are sharp throughout the zoom range. Smooth, fast and accurate autofocus is provided by the Ultrasonic Motor (USM) and the lens' minimum focus distance is 1.25'. As an L-series lens, it is provided with weather sealing to protect it from dust, moisture and cold and fluorine coatings on the front and rear lens surfaces to resist smears and fingerprints. 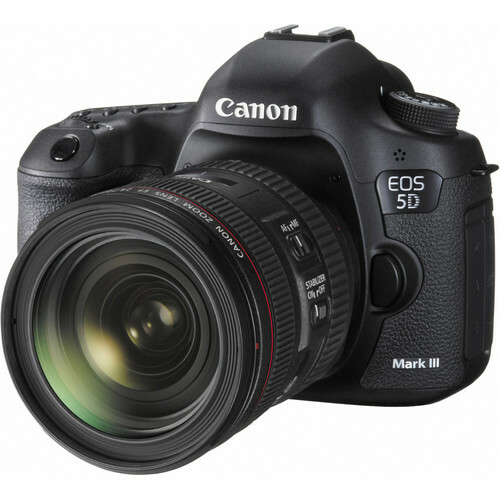 EOS 5D Mark III DSLR Camera with 24-70mm Lens is rated 5.0 out of 5 by 16. Rated 5 out of 5 by Photostyle1 from Everything I expected and more I highly recommend both the EOS 5D Mark III camera and the 24-70mm f/4L lens, not only for the kit value but for great design, high quality and capability. An amazing amount of thought was put into the design of this camera which includes high resolution, fast accurate focusing, and high shutter FPS. It feels very sturdy and the controls all seem to be well placed. I think Canon must have listened to every pro for advice on what to design into this wonderful camera which allows tons of settings for those who want to control everything about the camera. You can also set it to shoot with the greatest of ease using the simplest of settings, whatever your desire. The 24-70 f/4L lens that came with this kit is great if you want a lightweight, less bulky, less costly, and image stabilized (IS) lens, compared to the heavier, bulkier, non-IS f2.8 lenses. It's also a great travel and on-the-go lens, f4 is plenty bright with narrow enough DOF for most situations, and has a very close Macro with hybrid IS so you don't need a tripod. Rated 5 out of 5 by malibugriff from A big leap for this former Rebel owner I purchased a Rebel T1i in 2010 when I was getting into photography as a more serious hobby. While I was happy with that camera and the two Canon EF-S lenses that I purchased to go with it, I found myself frustrated with some of the results. I teach and direct theatre, and I needed a camera and lens that would serve me well under theatrical lighting, which is often dim. While I haven't had an opportunity to use the EOS 5D Mark iii under theatrical conditions yet, I have used it in low lighting at home around the Christmas tree and at a Christmas party in a dimly lit restaurant. In both cases, I've been very pleased with the result. The 5D Mark iii is much heavier than the Rebel T1i, but that's to be expected since this is much more substantial piece of equipment. I have a lot to learn with this new camera, but I'm excited to start exploring the various features. Be aware that this kit comes with the 24-70mm/f4 lens, not the24-70mm/f2.8 lens. The latter is much more expensive than the former. There is no bundle that I'm aware of that provides the f2.8, so if you're looking for that lens, you should purchase the camera body by itself and then add the lens separately. Rated 5 out of 5 by Sheila G from Worth the price Love the low light details; the amazing features and flexibility and the professional quality results. Rated 5 out of 5 by Anonymous from canon 5d A great camera!However, the number of new buttons and controls is daunting. The instructions are so small that I needed a magnifying glass to read.Works with all my Canon lenses. Rated 5 out of 5 by Mike from A big jump for a happy 40D user What an amazing camera! I have had a 40D since early 2009. It was a great camera. Reliable. Dependable. I put some F/2.8 glass (EF-S 17-55mm and EF 70-200mm L USM) in front of it and it kept me happy. Got the job one. Putting that same glass in front of the 5D Mk3 is a whole different animal. I debated whether to purchase the 24-70mm kit or the 24-105mm kit. My wife has the 70D with the 24-105mm, so I decided I would add the other (24-70mm) to our bag. Very happy with the lens. I have to admit that anytime I tried to use my wife's 70D it would aggravate me since I was so used to the 40D features, button/dial locations/functions. But, I have to say that I made a pretty easy transition over to the 5D Mk3. I have only one regret. And, that is waiting so long to make the transition to full-frame. Rated 5 out of 5 by Juan88uy from Breathtaking I had a 7d, the 5d was a huge leap. Excellent. 8 stars rating. Rated 5 out of 5 by Anonymous from EOS 5D Mark III good improvement Faster and more accurate focusing. Display screen for both video and photo is excellent. Excellent camera for amateur photography. Yes; in regards to the above item, the Canon EOS 5D Mark III DSLR Camera with 24-70mm Lens, B&amp;H # CAE5D32470, may be shipped to Guam. In regards to other items on our website, while we do ship internationally, do note some items have international shipping restrictions and cannot be shipped outside the United States, and due to the chemical makeup of other items, some items cannot be shipped at all and can only be purchased in our NYC Superstore. These items are identified on our website as such, and if you do add the items to your online shopping cart, during the Checkout process on the Shipping Option page, it will notify you that there are items with shipping restrictions in your shopping cart, identify the items, and instruct you to remove the items from your cart to continue placing your order. How do I select notify when in stock feature? Unfortunately, at this time there is no Notify when in stock available for this combination. We still have the 5D Mark III body-only in stock. Is this made from japan? The Canon 5D Mark III and Canon 24-70mm are both made in Japan. Note that the warranty you get will be for the country of purchase, unless you buy a gray market version, meaning a product not specified for your country. Does this come with some type of warranty that is included in the price? I know the last camera I bought I had a 2 year warranty and that included one cleaning a year and they would check from any problems and if their were any they fixed them for free. Does the warranty, if there is one, include cleanings and inspection? If not how much is it to get this sent in and have done? The Canon EOS 5D Mark III Camera Kit with 24-70mm f/4L lens comes with Canon's one year, limited warranty, which will cover any manufacturer or workmanship defects. It will not cover cleanings and inspections. There are many third party service companies that may offer cleaning and inspection services, and I suggest you look into your local businesses to see if there are any that offer this service. I you all ready have a 18-135mm lens would you buy the 24-70mm lens? The kit lens is only F4, not 2.8. I wouldn't if i were you. How much storage does the camera have? Are most of you satisfied with the f/4 L-class kit lens? I like the focal lengths in that lens, but f/4 is about where I hesitate when it comes to lenses (I try to stay at or faster than f/2.8). Interested in your comments. Thanks. The lens that come with this camera is 24-70mm lens Mark 2? Hi Tony,Yes, it is. A very good lens, by the way.